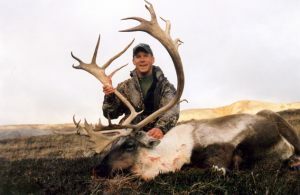 Alaska Wilderness Charters & Guiding offers world-class Alaska caribou hunting. 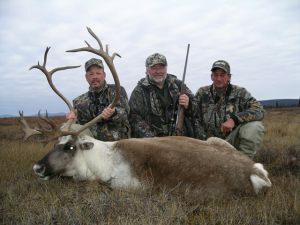 Both our unguided Alaska caribou hunts and guided Alaska caribou hunts are based out of Kotzebue. Northwest Alaska is home to the largest herd of Barren Ground Caribou, called the Western Arctic Herd, with a population of 300,000 animals. Barren Ground Caribou hunting has never been better! 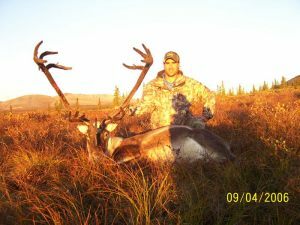 Alaska Wilderness Charters & Guiding is the premier guiding operation in northwest Alaska. Our success is unmatched. 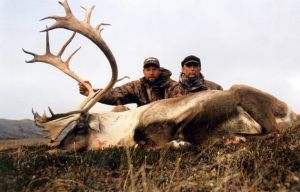 Caribou hunters have enjoyed tremendous success on this hunt over the years. 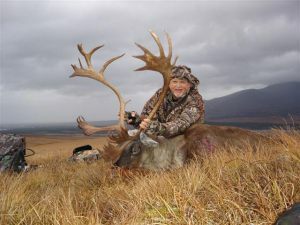 There is no other place in Alaska where you can find better odds in harvesting a trophy caribou. 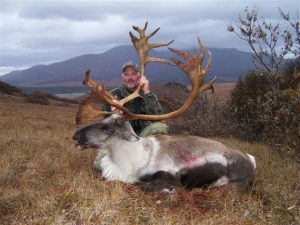 Caribou hunting in Alaska also provides a true “remote” arctic adventure. 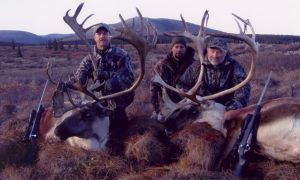 Alaska Wilderness Charters & Guiding bases operations for caribou, moose, and grizzly bear hunting out of Kotzebue. Kotzebue is a small native village with a population around 3000 people, which sits on the tip of the Hotham Peninsula on the shore of the Chukchi Sea, just north of the Arctic Circle. 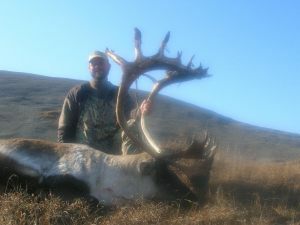 We offer 2 options for Alaska caribou hunting; fully guided, unguided (with equipment rental). These options let each hunter choose the one best suited to their personal needs and preferences. 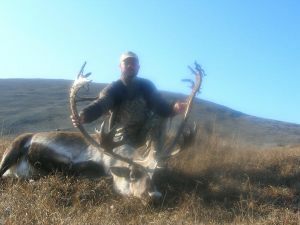 Our unguided caribou package is a very hassle free hunt for the do-It-yourselfhunter. 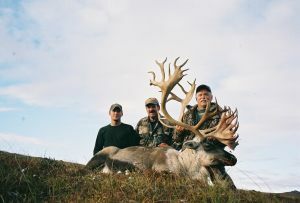 Hunting caribou in remote Northwest Alaska can bring many challenges in preparing for a hunt. 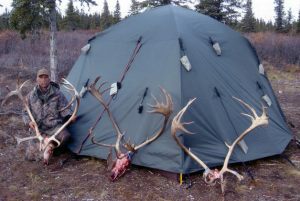 Items such as buying and shipping all of the camping equipment, buying food, cooking equipment and fuel, transportation to and from the field, transportation in town, dealing with the meat, capes, and antlers, return shipping, and many other hurdles must be addressed (notice you haven’t even selected a hunting location yet!). 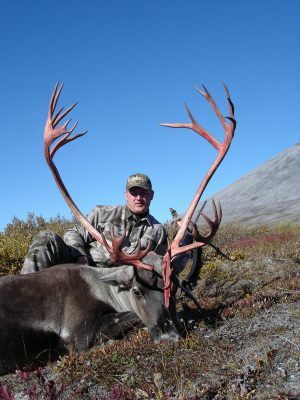 This is just the start of the things hunters need to consider when hunting caribou in Alaska. Our packages are designed to eliminate all the headaches and hidden costs that one can incur. When hunting with us, you will have help and guidance with all of these sometimes-difficult tasks, allowing you to concentrate on enjoying your vacation. 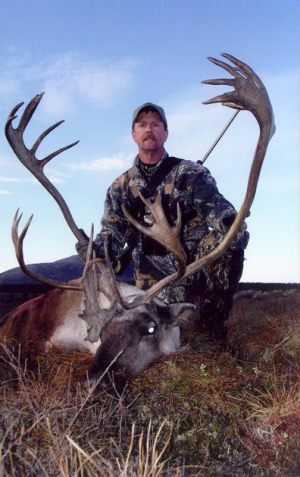 We take care of all the logistical hurdles, and provide you with detailed pre-trip information about your hunt. You will find our Hunter’s Information Packet covers a wide variety of topics to answer many common questions, and assist you both in preparing for the hunt, and while in the field. Our detailed gear list provides “worry-free” packing, and will ensure you have the proper and necessary items with you. Upon arrival, hunters will be picked up at the Kotzebue airport and taken to our operations base. Here they will be given a detailed orientation, look at all the equipment and food that we provide, and get all of their personal equipment ready for the flight out to the field. Hunters are then flown out to the field with all necessary camping equipment and food to a location we feel will be the best for success. We encourage hunters to buy a wolf tag. 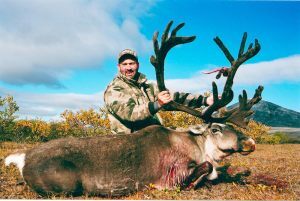 Many of our unguided caribou hunters will have the opportunity at taking a wolf. If you are into fishing, you will want to also purchase a fishing license, and bring a packable rod and a few spinners. Northwest Alaska has fantastic char and grayling fishing. Char can grow to over 20 pounds in this region. 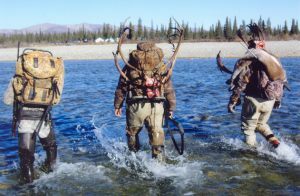 At the end of your hunt, you will be flown back into town along with your gear, meat, and trophies, where our personnel will be eager to hear about your adventures in the field. Our personnel will assist you in making arrangements to expedite your trophies, and get you and your gear to the gate for check-in for your return home. 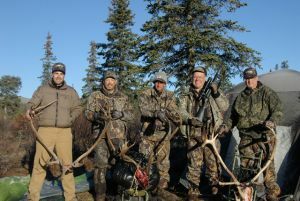 This is the ideal hunt to bond with your best friend or family member(s), as the memories you share with them will last a lifetime! 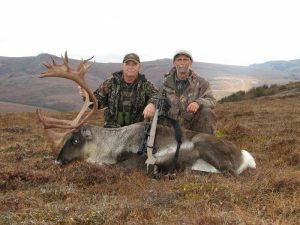 Our fully guided caribou hunt is for hunters looking for that extra edge in finding a trophy caribou, and prefer to have help with all the work that Alaska caribou hunting entails. All staff members have had many years working with us in this area and are very professional and excellent hunters as well as outdoorsmen. They are also first aid and CPR certified, in case of that unexpected emergency. In these camps we have satellite phones for communications and emergency use. 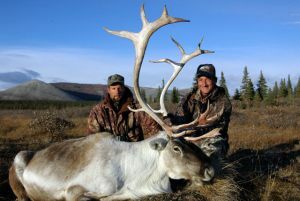 Our professional guides will work hard for you both in camp, and in finding a trophy caribou that you will be proud to hang on the wall. 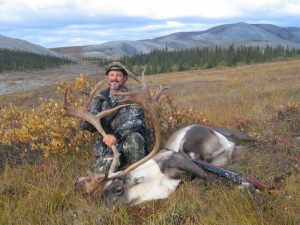 Guided caribou hunts are much easier as your guide and packer will do all of the skinning, packing, prepping the hide/cape, cooking and camp chores; allowing you to sit back and enjoy the beautiful arctic scenery and wildlife that draws us to this region. 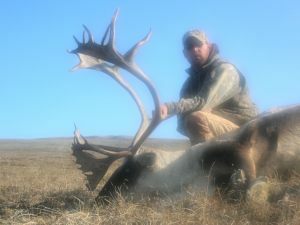 This hunt is a great hunt to combo with moose, grizzly bear and wolf. 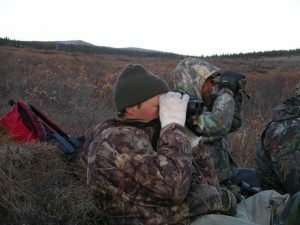 Many of the Guides also carry video cameras (or will operate yours) to capture your hunt and daily activities for you to have forever to remember your Alaskan hunt. 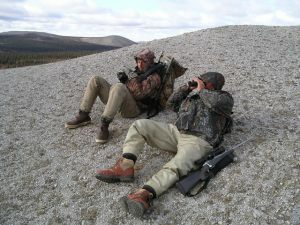 Hunting days will be spent glassing the mountains for caribou, moose, wolves and grizzly bear. Good binoculars are a must. Our main guided caribou camp is ideally located on top of a long ridge; caribou migrating through this area often pass right by camp. 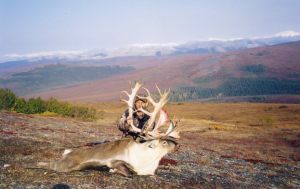 This location has produced many record book caribou for us over the years as well as many grizzly bear and wolf. It is also a great location for someone who cannot get around well. 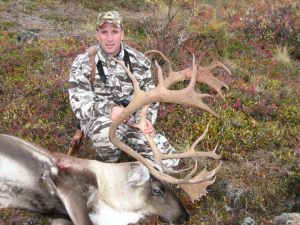 Alaska Wilderness Charters & Guiding starts caribou hunting during the early portion of the caribou migration in late August. 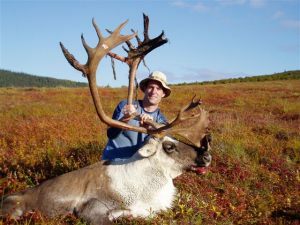 On these early caribou hunts, caribou have a tendency to be in the mountains, coming down to the lower elevations to feed, then returning back to the mountains in late morning to take advantage of cooler temperatures. 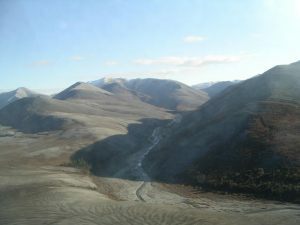 The caribou migration is directly related to the weather. 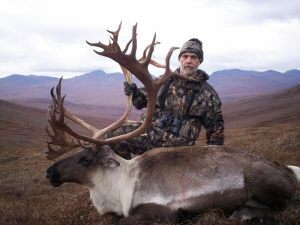 Cooler fall temperatures will trigger the start of the migration forcing caribou to group up and move out of the Brooks Range into the winter range of the Kotzebue Sound. 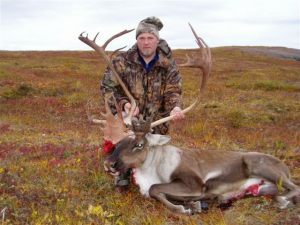 The migration starts on the north side of the Brooks Range, where the caribou have spent the summer raising their young and feeding heavily to put on weight that was lost during the long winter. 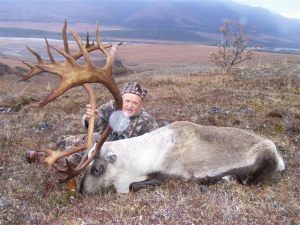 With our large caribou hunting area we are able to keep hunters placed along the current caribou migration throughout the hunting season. In addition, hunters often see moose, grizzly bear, black bear, dall sheep, musk ox, wolves, and wolverine while in the field. 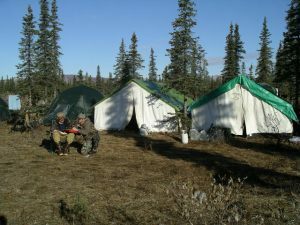 Our caribou hunting camps are placed in locations that have consistently produced for our hunters year after year. 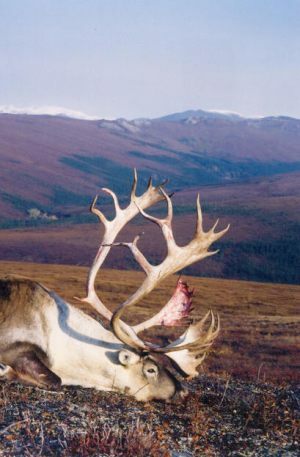 Caribou have been using many of these migration routes for hundreds of years. Hunters often ask, “How many caribou will I see on my hunt?” Caribou are migratory, with weather playing a huge factor in their movement. 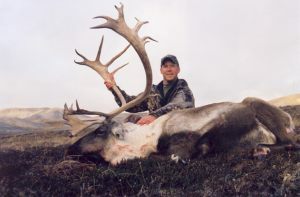 Caribou hunters should expect to see a varying range of caribou during their hunt. 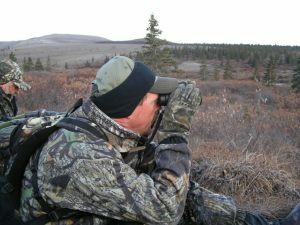 Most hunters see from 20 to 500 caribou per day. 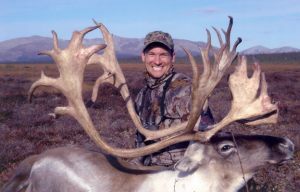 While herds of several thousand caribou are impressive to see, it is not common, no mater where you hunt. 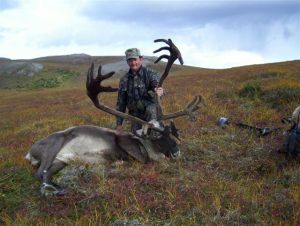 Typically the caribou begin to shed their velvet the last week of August, with the larger bulls shedding their velvet first. 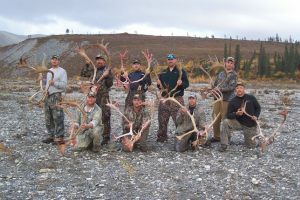 During the remainder of the season, caribou will be hard horned. Our hunts continue through the month of September as the migration continues. 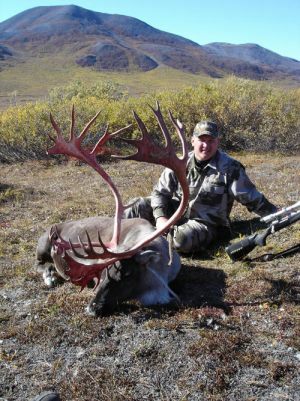 When planning your travel for this hunt, you should plan on traveling to Anchorage and spending the night at the hotel of your choice. 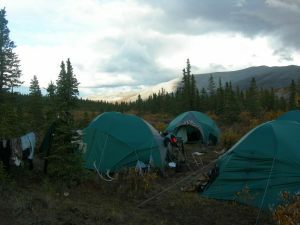 Anchorage has a wide variety of hotels and eating facilities from budget to 5 star accommodations. 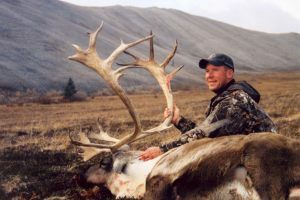 Hunters should arrive in Kotzebue on their scheduled arrival day via Alaska Airlines. This is the first flight out of Anchorage to Kotzebue in the morning. Our staff will greet you at the airport in Kotzebue, and take you to our operations base, where you will have plenty of time to prep your gear, review the gear, equipment, and food we have prepared for your camp, go through our detailed field orientation, and fly out to camp.We do not recommend hunters arriving in Kotzebue before their scheduled date. 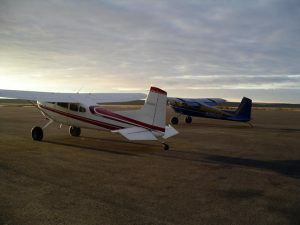 Facilities in Kotzebue are very limited. This includes hotel and dining facilities. The Nullagvik Hotel and the Bay Side Restaurant/hotel are essentially the choices for dining and lodging – on occasion there are others, but their availability cannot be counted upon. In addition, Kotzebue is a “damp” village, so unless you bring your own beverages, alcohol cannot be purchased. For your departure from Kotzebue, you should book an Alaska Airlines flight on the day you are scheduled to be picked up from the field. This flight departs Kotzebue in the evening, and returns to Anchorage. In Anchorage you can either continue on your travels via a “red-eye” flight, or spend the night and continue your travels the next day. On all of our guided and outfitted hunts we supply only the best in equipment. All equipment is cleaned and checked prior to your hunt to ensure that it is in proper working order. 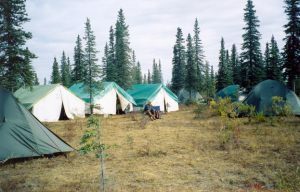 Camps are supplied with Cabela’s 6 man tents, cots and chairs, and all necessary cooking equipment, as well as a wide variety of quality food - including fresh pork and beef, and many canned goods. 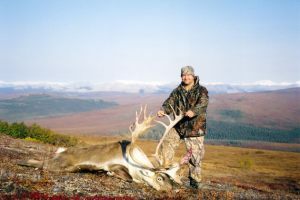 On the unguided hunts, clients will be able to make many fast and hearty meals. On the guided hunts, meals will be prepared for you. Be sure to check out our Gear list and Hunter Information Packet for additional details. 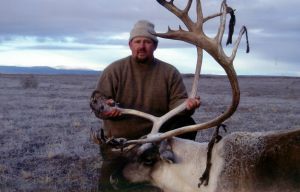 Alaska Wilderness Charters And Guiding will help you with expediting your trophy. We work with Alpha Fur Dressers in Anchorage. They will tan and ship your trophies to you or your taxidermist. We do not recommend traveling with or shipping green capes to the lower 48, as it is risky and very expensive. Keep in mind that you will be in Kotzebue, where many of the shipping options and conveniences available elsewhere, are non-existent. 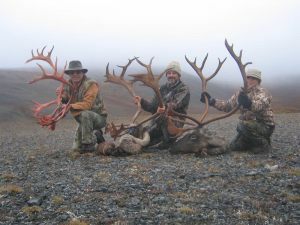 We have extensive experience in shipping to/from Kotzebue, and provide our recommendations for expediting to best ensure the quality of your trophies as well as for the best value for you. Hunters must also decide what they wish to do with their meat. Caribou meat is very delicious; however getting it back to the lower 48 takes some effort and expense. Shipping meat to the lower 48 from Kotzebue is very expensive. 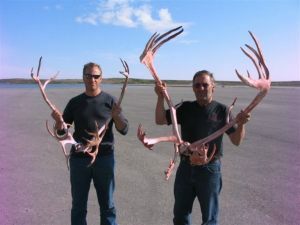 We recommend hunters wanting to take meat home check it as excess baggage, and take it with them on the plane when they depart Kotzebue. The excess baggage fees are far less than direct shipping costs. Hunters can also donate their meat, and our personnel will assist with this. However, remember the meat belongs to the hunter and it is your individual responsibility to properly take care of (Alaska Law). 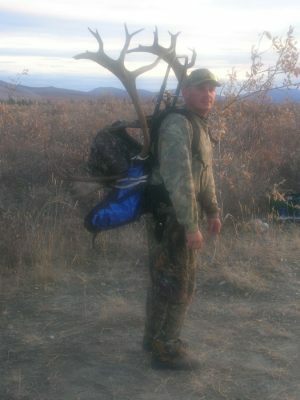 Some hunters bring insulated coolers to transport their meat home in. This does work well, however with recent changes in commercial airlines baggage restrictions, we no longer recommend this. 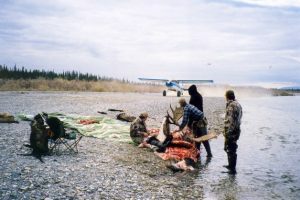 Hunters can purchase airline approved “wetlock” boxes in Kotzebue for a nominal cost to ship their capes and for meat transportation.